There were three things which were hard to balance during this shoot. The blinking hazards from the car – the yellow flashers on. This essentially painted the foreground of my shots with a yellow orange. 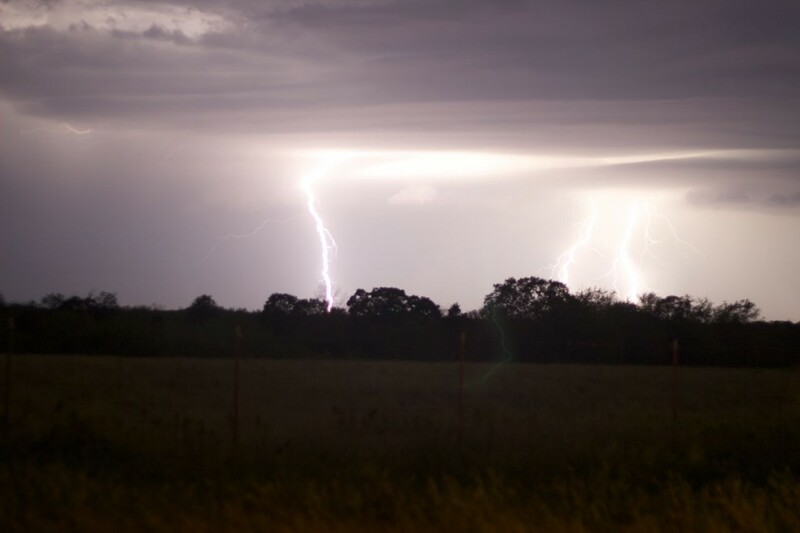 The bright flashes of lightening – There were quite a few really intense bolts of cloud-to-ground lightning this made it hard to set the light levels correctly. 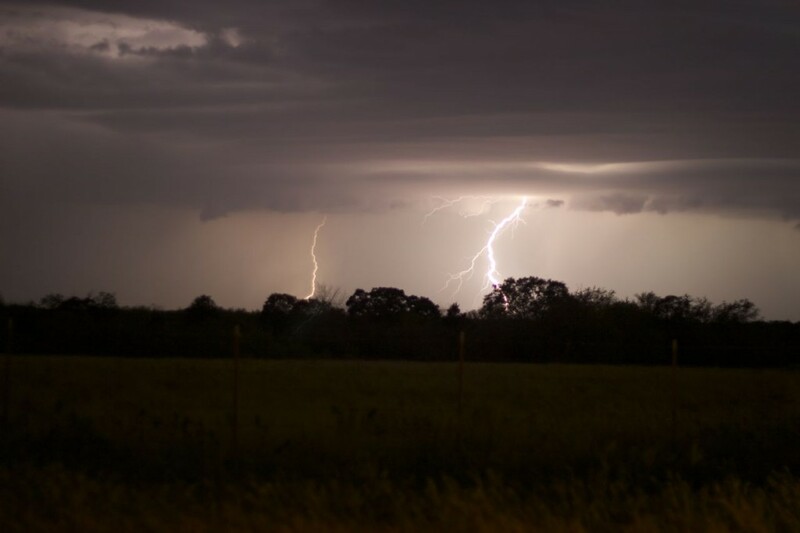 If I was set up to make clear shots of small bolts of lighting (meaning with a high sensitivity to light) then images would white out when there was a big flash. Using a UV filter when shooting lightning – In several of my images a light green bolt of lightning ascends from the ground. I have read that this is caused by a reflection in the lens caused by using a UV filter. You can sees this in the unedited photo below. Unedited photo showing some bleaching/white-out, the orange painting of the foreground and the green bolt. So I was showing my friend Josh my most recent shot and he popped the RAW image into Lightroom and adjusted a few of the sliders and we ended up with the image below. Here is the same image as above, but after making some corrections in Lightroom. 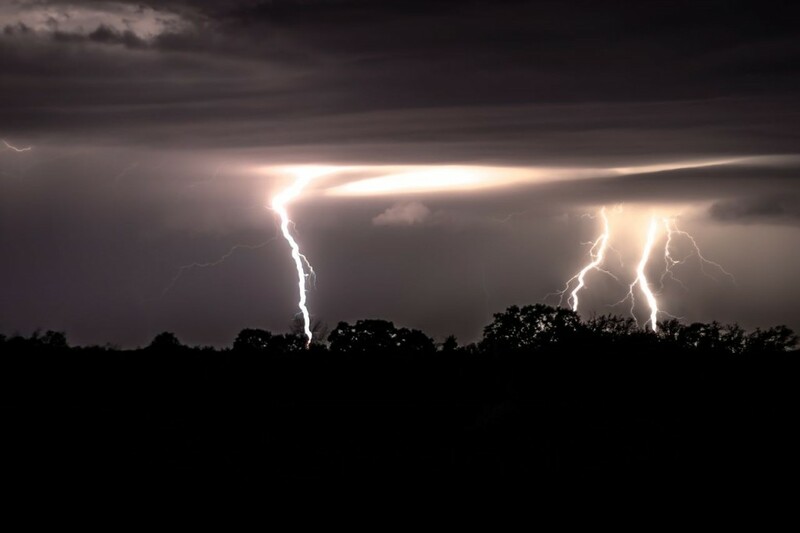 This entry was posted in Outdoors, Photography, With Becky and tagged lightning, Photography by Hugh Paterson III. Bookmark the permalink.